You've found the “U.S. Rouen Duck Breeders” page here at Hobby Farm Wisdom! If this is the first time you have visited our site: Welcome! The Rouen Duck is one of the most popular breed of North America. It is raised primarily for decoration or as general purpose, since it is not a prolific egg layer. The males have green heads, white collars, black tail feathers and a gray body. The female Rouen ducks are mottled light and dark brown, with a black crown and eye-stripes. 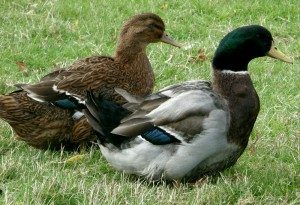 Even though they look like the Mallard, the Rouen birds are about three times the weight of a Mallard and they do not fly easily. Rouen Ducks are second to only Pekins and Muscovy in size and are said to have the most flavorful meat.